CA17 is shaping up nicely. With some really fantastic talented TO’s at the helm of what will be the highlight to any gamers year. Its time to get your fix of the castle and all it has to offer. Castle Assault is back for its 9th year! With the demise of Warhammer the event has taken on a new path. What is becoming the norm the player don’tchange but the systems do. So to cater for the needs of the many this year we will have many events… well 4 to be exact. With only limited seating the events are given set seats if they dont fill them it goes to the next system. Will Castle Assault be able to uphold with such a mix of systems?? Hell yes as all the players that you have come to know and love are still all in the one place they will just be playing a different system. Is CAMoMA still a thing. Yes it is. Can Fury still sing Mr Bright Side and make me wet my pants?? Yes he can and will. Will Kendall say something completely random? We can only hope. Will Nic actually win an event…? Sadly no as he is running the event. Can Jack drink? Some say they have never seen him have more than 1 beer the entire day. Tis true.. The Players Pack for Castle Assault has been released and people are quickly signing up! This will form the key rules that the games will function under, and the scoring system to deteermine players placings. The Castle Assault Warhammer Fantasy Tournament is back for 2014! The event has grown so large, that this year Castle Assault is solely dedicated to Warhammer Fantasy. We have simply outgrown the amount of space and resources we have to include any other gaming systems. We are capping the event at 100 players, making it our biggest year ever. This year the event will have two TO’s, both Rojo and Kent Fury, to ensure that everything runs smoothly and players get the gaming experience that they are looking for. Whether we reach the full 100 or not is unknown, but at Cancon this year 124 players competed in the country’s biggest 8th Edition Fantasy event to date. We know that whatever level of attendance is achieved, everyone who comes along will go away with a huge sense of satisfaction from the gaming and comraderie experienced. Castle Assault 2014 – Here comes fun! One part of the Castle Assault Players Pack that I have been quite proud of over the years has been the Scenarios and associated Bonus Points on offer. With some slight tweaks to the rulebook format we’ve ended up with some challenging tasks which we find work well in a tournament environment. One of the major findings of early 8th Edition Tournaments was that the scenarios really should be used and that the idea of 5 Battleline games was not only a little boring, but would favour players that chose tougher min/max lists that played one way and with little versatility. Some scenario’s could be a little annoying and random in nature so a number of Tournament Organisers set about trying different things and what we have now at Castle Assault has be born of these experiments and remained largely the same over the last 3 years. At Castle Assault, our scenarios form the basis of 5 Battle Points that can be scored between the players, in addition to the 15 Battle Points that can be scored due to Victory Points. Some tournaments provide bonuses in the form of Victory Points, which is perfectly fine. We’ve done it this way though and found it to be successful and provide the Scenarios with a degree of legitimacy, considering they account for 25 % of the score. So let’s discuss the scenario rules, what new tournament players should consider when designing their armies and also answer any FAQs about them. Our first match is played as per the rulebook, with the addition of bonus points relating to unit Standards. By getting unit standards into your opponents deployment zone and keeping yours free of theirs, you can score somewhere between 1 and 5 Bonus Points. Considerations? Well, firstly, I guess you will need to have some Standards if you wish to pick up the points for having them in your opponents deployment area. Another consideration may well be about the mobility of your Standard carrying units. Fast Cavalry, Scouts, Flyers and other units that enter the field from the sides or even your opponents deployment area (for instance Dwarf Miners) can all make the task of getting into that zone a lot easier. This scenario without adjustment can turn into a one-sided game quite easily and we therefore add some Objectives in the middle of the playing field. If one side has a lot of extra shooting than the other, it can sit back and wipe out the enemy without having to come forward. In other matchups, both players might find it less risky to stay back and play for a draw. At Castle Assault, the 5 Bonus Points are on offer for capturing the middle objectives. Considerations? Firstly, having an Objective to place is a pretty big consideration. Something in the order of 40 x 40 mm to 50 x 50 mm is ideal. The instructions for placing these should be fairly clear in the Players Pack, but feel free to ask the TO if you have any slight doubts. Capturing the objectives also comes down to both being close enough and having enough static combat resolution to claim it (therefore a unit with ranks, standard and even your BSB, would be the ideal candidate for claiming). Basically I’d look at where you need to be by the 6th turn and how you will get there at the right time. In this scenario, the game can end early. As soon as one side “Breaks” the game is over. This can seem quite fatal to the enjoyment of the game. However, the organisers of Castle Assault have given this long consideration and have looked at how this actually causes players to really think quite carefully about how they play this game and some real tactical tussles can emerge. Firstly, players need to consider the obvious factors of trying to keep their army from breaking. This could be as wide ranging as putting their characters somewhere other than their normal planned deployments. It might be not casting with, or lightly using, your Mage(s) magical skills if the risk of Misfire might cause your General or BSB to die. You might have to be very careful if your Opponent has Death Magic and can try and “snipe” your General and/or BSB. In list selection, you will also need to consider how many Fortitude points will be necessary for you to be able to compete adequately. Secondly, if you do have the upperhand in the battle, you may need to consider when you break your opponent. It is possible, if you play well, to hold off breaking your enemy if you believe you can first pick up more Victory Points before finishing them off. This, I feel, is an added element that rewards generals that can think ahead and is one small part of the process of finding out who was the best player over the 5 games of the tournament. For example, a player might have his opponent beaten, but surround the Generals unit and refrain from charging until mopping up other units. Another interesting option might be a losing player charging his General out solo to get him killed if it saves a bunch of Victory Points in the long run. Very cinematic! This is our most different scenario from that found in the rulebook. We’ve taken the Watchtower scenario and made it so that the unit inside is not Steadfast. We’ve done this because sometimes a player can get a unit inside the Watchtower and it can be extremely hard to impossible to remove it. 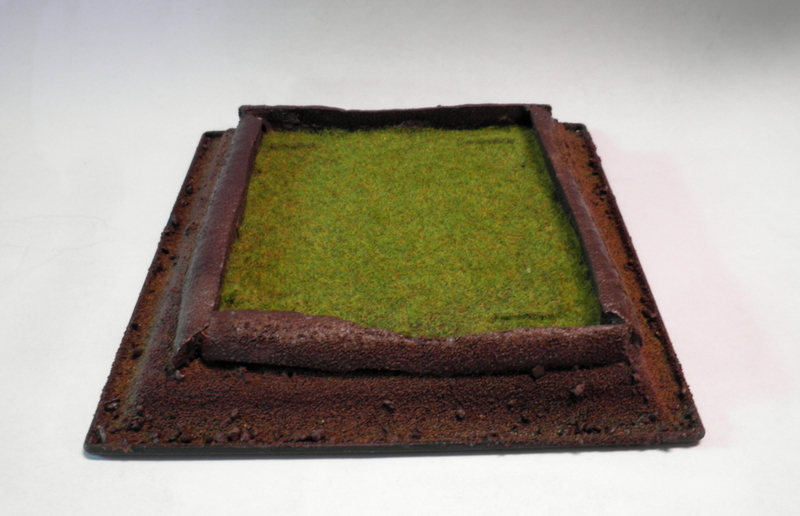 For this scenario a small fortified hill called a Redoubt is placed in the centre of the board. You can see a picture below of what this looks like. It should be about 5 x 5 to 6 x 6 inches in area. Like the Watchtower you might want to consider whether you will take a Core unit with 20 models or less to place inside the Redoubt if you win the roll off. 1. How does the Redoubt effect Cannonballs? A cannonball or similar template type weapon or spell will hit the unit inside with D6 hits at the highest strength. Like an obstacle or building, the cannonball will stop and travel no further, so it won’t hit units behind the Redoubt. 2. How does the Redoubt effect line of sight? The Redoubt will operate under the rules for True Line of Sight. Although it is a fortified hill, it is really a unique piece of terrain, so it isn’t considered to be infinitely high. This battle should simulate a really heavily contested piece of ground and we think that this ruling is a better option than having a unit, character or monster hiding behind it and then popping in at the last minute. A Dark Elf character with the Stubborn Hat and Pendant of Khaleth, for example, leaving it’s unit and hiding with impunity behind the Redoubt before entering it is not the type of play that we are really hoping for. Having a major obstacle right in the middle of the field is also not desirable, especially when there will already be a number of hills and impassable terrain features on the board. This one is fairly straight forward. We’ve taken the Battleline scenario and added Bonus Points for killing opposing generals and BSBs. Not much to say here. Overall, I feel that these scenarios will ensure that the truly best generals should emerge at the top of the field. Someone that takes a tough min/max army with the idea to simply smash the opponent, and deny the enemy points, will potentially miss out on a lot of Bonus Points that are on offer. Blood and Glory particularly encourages players to take standards and BSBs and not rely on small avoidance units of skirmishers/redirectors, monsters and monstrous cavalry and hence points denial tactics. Battle for the Pass with objectives punishes gunlines that can’t claim objectives. Dawn Attack punishes the 3 horde unit builds that could be more easily spread out and isolated. Anyway, I hope that you enjoy the tactical play that comes from these Scenarios. If you have any questions about the Scenarios, please post them here in the comments or in the Wargamerau Castle Assault section of that forum. I’ll be sure to answer them as quick as possible.